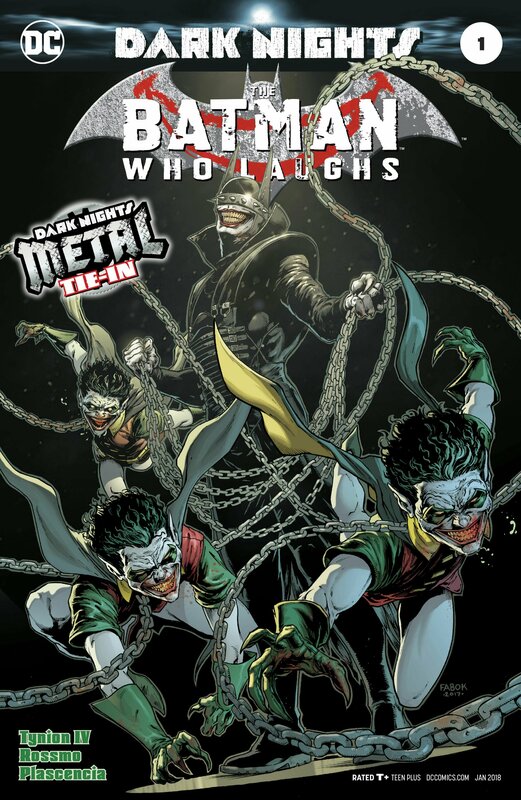 This week’s Dark Nights: Metal tie in, The Batman Who Laughs # 1 is purely twisted. And we have to thank writer James Tynion IV and artist Riley Rossimo for the Batman Who Laughs origin. In case you’re wondering this is the evil Batman and Joker hybrid who made his way to this DC Earth after Batman was turned into a portal to the dark multiverse. This Joker started in Earth -22 and the story begins after The Joker once again terrorizes Gotham City with Batman incapacitated with drugs. Joker reveals that he killed Commissioner Gordon by melting him in a vat if acid. Even mocking Batman with Gordon’s trenchcoat and pipe. He also starts taunting Batman by killing families walking down a dark alley, eerily similar to the crime that birthed Batman. 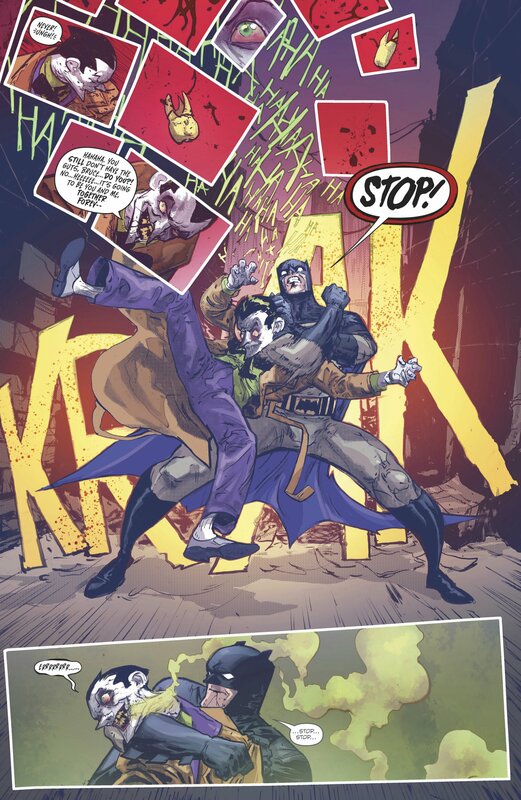 Batman snaps from his drugged state and proceeds to beat Joker with the latter taunting Batman that he will never stop coming for Wayne and his family. And then Batman kills Joker by snapping his neck. Days later Superman and Batman discuss the fate of the kids that have been infected by Joker’s latest Joker venom. 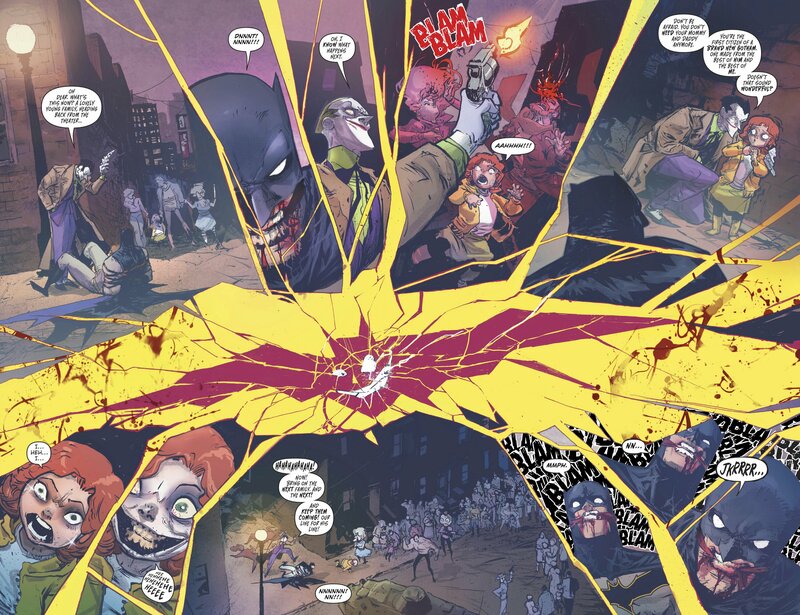 This is where the first signs of infection appear as Batman laughs at Superman’s report that one infected kid almost killed a psychiatrist. Days later, Batman calls in the family for some training and some talk. 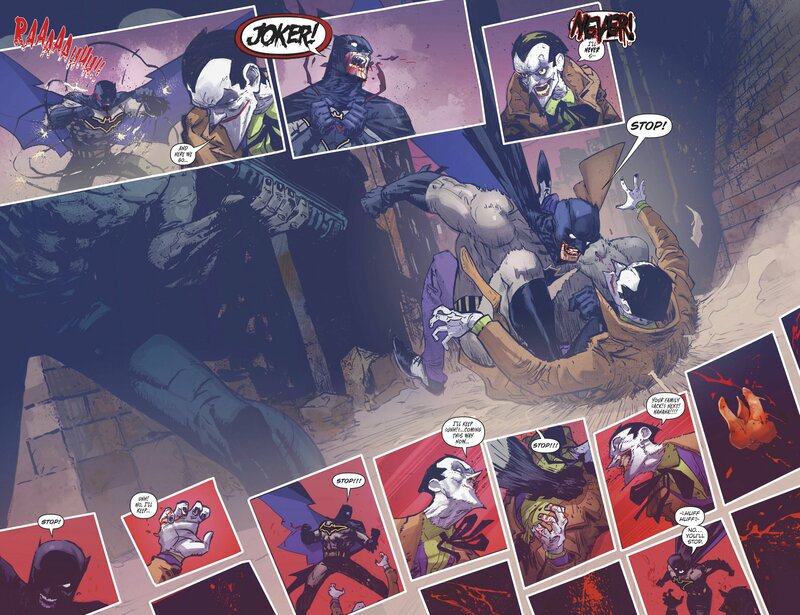 During their talk, Batman informs the “family” that he has been infected by a new strain of Joker virus, one that has already begun taking over his mind. Nightwing tells Bruce that they will find a way to cure him and that they will do it as a family. One of the two heartbreaking moments in the Batman Who Laughs origin happens when Batman admits that he called in the family to stop them from warning the other metahumans, including the Justice League, and stopping him from his plans. The Batman who Laughs guns down his ‘kids’. Days later and with nobody able to stop him, Batman attacks the Justice League watchtower and kills most of the JLAers except for Superman who has gone blind during the attack. With the Joker doing the driving, Batman taunts Superman and gives the second biggest heartbreak in the Batman who Laughs origin story, he reveals that he also brought along Lois Lane and Superman’s kid Jonathan Kent (now also blind from whatever Batman did off-page). To finish his “masterpiece”, Batman/Joker throws in a synthesized black kryptonite on the Kents. This kryptonite turns the two Kryptonians rabid and they tear apart Lois off-panel with Batman watching in delight. The origin story ends with Joker killing everybody in the universe; according to him they threw everything at him including “armies of supervillains” as well as “gods”. 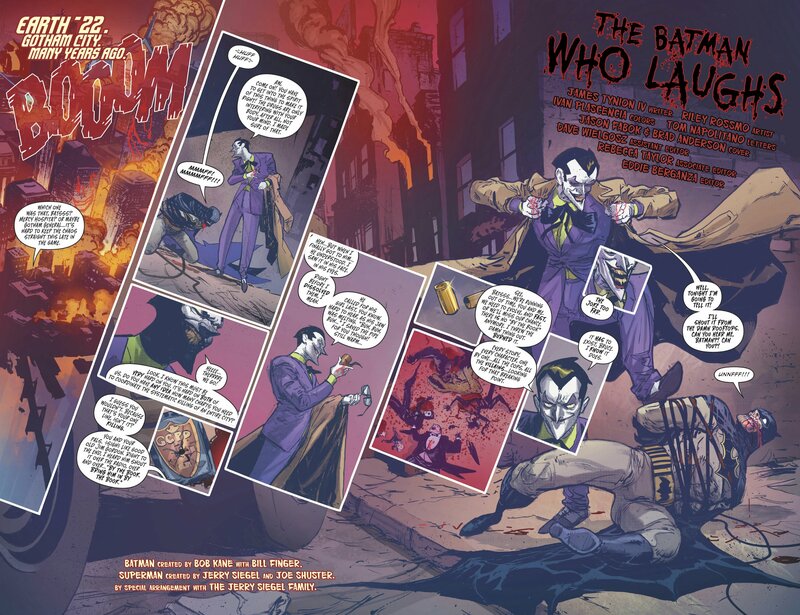 With nothing to do and only the Robins and Dark Damian to accompany him, The Batman who Laughs is approached by Barbatos and offered to kill “The Batman” on Earth 1/ Earth Prime. He ends the issue with a teaser of the horrors that await the positive multiverse once Barbatos succeeds with his plans and we get to see different corrupted versions of the Leaguers including a Parasite-Superman hybrid and another Superman that looks like Brainiac. The Batman Who Laughs # 1 is now available at your favorite LCS. Get it now and do pick up the next part of this saga, Dark Nights: Metal # 4. I personally recommend Comic Odyssey for your singles stuff.